Christmas time is around the corner! Are you planning your next trip to a new destination? That’s perfect because there are amazing places to visit in Europe during Christmas time! One of the best things about this time of the year is, of course, the markets! The food, stalls, decorations, huge trees, lights, the setting – each is much better during Christmas! If you are wondering about which cities to visit in Christmas, here are the best Christmas markets in Europe for you. Enjoy a warm and a cozy holiday along with a wonderful market! Merry Christmas everyone! Christmas market in Strasbourg started in the 1570’s. This was a very early date compared to other cities! 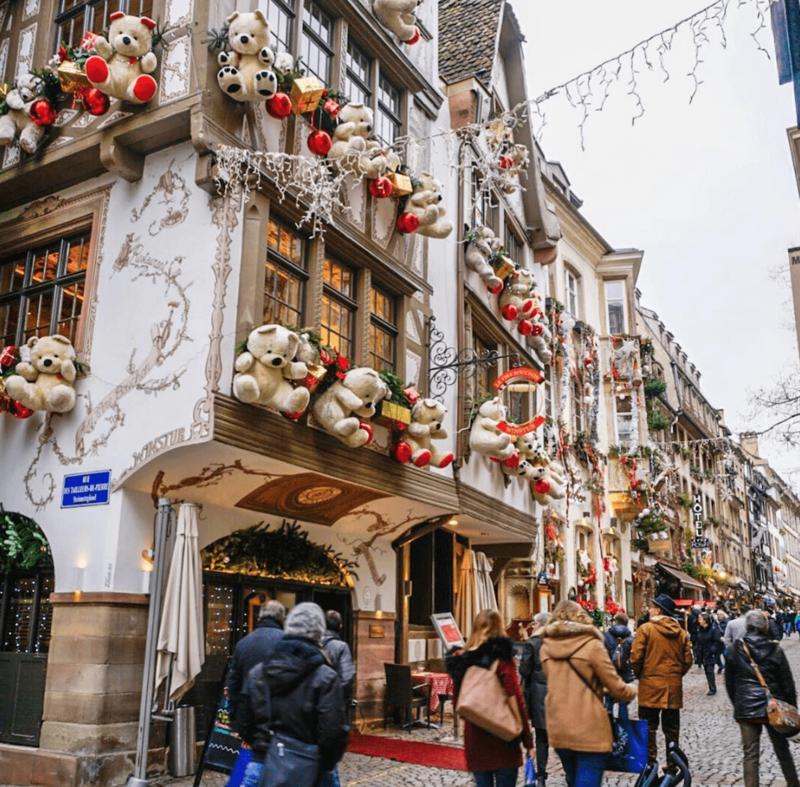 The market here is so famous that Strasbourg is even called as the capital of Noel! The people visiting the town during Christmas are very high but also very affectionate about this holiday as well. While the market is on, the famous cathedral of Strasbourg are covered with colorful lights and Christmas decors – looks terrific! Don’t miss the opportunity to be here, it is the best place to be around Christmas time. Do you want to visit another town near Strasbourg? You sure can! During Christmas time, Colmar is much more relaxed than Strasbourg. If you feel like you need a less touristy area, Colmar is a great option! Here the suburban city has an amazing setting for the Christmas as well. The houses are decorated with vibrant decors and lighted up. The market is full of amazing gifts and Christmas items, delicious cookies, and treats, mulled wine and many more! What else you can ask for? Location: Different locations; Place des Dominicains, Place de l’Ancienne Douane, Place Jeanne d’Arc, La Petite Venise and a new addition with Place de la Cathédrale. Nuremberg has one of the biggest Christmas markets all over the world! The history of the market here dates back to the 1600’s. The famous character of this market is Christkind – who opens the market traditionally. Christkind welcomes everyone to the market on the first Friday right before the first Advent. The market is full of handmade Christmas decorations, yummy food such as gingerbread and sausages, local beer and wine! Nuremberg is definitely a place to experience the Christmas soul and time. Don’t forget to grab a special tree decoration for the next year and taste the amazing food there! The last Christmas market for the year goes to Nuremberg. The most famous market in Germany. I definitely had a great time shopping, eating and sipping on my Glühwein here ? #nuremberg#nurembergchristmasmarket#germanchristmasmarket#germanchristmas#gluhwein#shopping#eatingtoomuch#traveltheworld#traveleurope ?? As you might already know, Cologne has a magnificent cathedral. During Christmas time, the market is set right in front of this amazing cathedral! The view and the ambiance are so great at here with all the stalls with lights and bright red roofs. These little stalls are called Buden here. Stalls sell anything from the classic Christmas decoration to artisanal glass arts, holiday wreaths, handmade tree figures, hot chocolate, Glühwein and if you are lucky enough you might even see the stall owner performing or crafting at their Budens. The markets are all over the city but the one in front of the cathedral is always a favorite if you want to discover others take a stroll around the town! Train: ICE, IC, Thalys and regional trains from Germany and other European cities to Koln Hauptbahnhof. The Christmas market in Manchester is known to be the first and the best one in the UK! So around Christmas time, if you are planning to stay in the UK – you know your destination! There is more than one location to set up the stalls in Manchester, however, the main market is set on Albert’s Square. The other markets are located in eight different locations scattered around the city. One of the most famous items at the market here is the Christmas mugs. Every year there is a special design mug which you can buy for the specific year! Besides, you can enjoy the hot chocolates with a bit of brandy, bratwurst, and mulled wine and of course beer with it! Location: Main market at Albert Square and others are scattered around the city. Over the years, the Christmas market in Prague gained a huge popularity. The ambiance of the Old Town in Prague, the young population and the traditions helped this market to grow even better and bigger! Beginning with the Advert, the stalls are set along the squares – mainly at Charles Square. The market is a great place to explore the Czech cuisine, pastry, traditional alcoholic beverages as well. However, you can also find something classic as well, something to make you feel home! The decorations are all over the places; wooden figures, glass deco arts, artisan ceramics, handmade crafts! Come here and enjoy the most vibrant Christmas market! Location: Old Town Square and Wenceslas Square mainly, also oaround St. George’s Basilica and Prague Castle. At the heart of Austria, Vienna has one the most mesmerizing environment of Christmas market. Here right in front of the famous city hall, the traditional market is set up every year. The market is also called the Vienna Christmas World. Along with over 150 stalls, there is a massive ice skating rink as well! You can also hop on a reindeer train, carousel too, so this market is perfect for families with little kids. The market offers you handcrafted items, decorations, warm drinks – both alcoholic and non-alcoholic, sweet and savory delicacies and gifts for you and your family! Location: On the square in front of the City Hall known as Rathausplatz, others on Belvedere Palace, Maria-Theresien Platz, Universitätscampus, in front of Schönbrunn Palace, behind the Volkstheater, Museumsplatz. Did you know that the Christmas market in Zagreb was selected as the best Christmas market? Not only for last year but for the last three years! The main markets are at the famous park in the city Zrinjevac and on Europe Square. Although, there are many other activity locations all over the city. The best thing about the markets in Zagreb is the music! Each market has a music event during the day. You can enjoy nice notes along with your mulled wine, special cookies, warm pastries, and good friends! Location: European Square, Zrinjevac Park and some around King Tomislav Square. Bolzano has the best Christmas market in Italy! Here you will be able to enjoy the beautiful landscapes of the Alpen mountains and the magical setting of the winter by snow. The city also hosts one of the long-lasting markets of the holiday. Bolzano still continues to keep the traditions alive as well. The white trees are decorated, Alpine decorations are everywhere around the town, the craftsmen make their own products. The children also have special activities available such as train riding, puppet shows, carousels! Have fun with warm strudels, apple fritters, polenta and mulled wine! Unlike other Christmas market around Europe, the market in Barcelona has a different vibe and feeling. First of all, you won’t see any mulled wine or grilled sausages around here. The market here is known as Fira de Santa Llúcia. Not very surprisingly, the market is the most famous and also the oldest one in Barcelona. There are a lot of stalls selling decorations, figures, wooden products. Especially Tió de Nadal is a popular figure in Barcelona. It is a Christmas log that is very traditional in Catalan culture and popular around Christmas. Therefore you will see many stalls selling it. Other than these, there will be some stalls selling artisanal products, toys, handmade products too!